Obviously, it is important to find office sharing space that rents exclusively to lawyers. Besides networking, you need office mates that appreciate the highly confidential nature of legal work. You owe your clients an atmosphere designed for privacy. Other attorneys will understand and act appropriately. Look for an office space that provides conveniences such as a common receptionist. With someone to take phone calls and greet clients, you are free to give attention to the details and needs of each case. Lawyers know that a simple mistake can have drastic results, so the ability to focus will enhance your performance giving your clients the best service possible. Search for shared office space in a convenient location that will draw clients in and make them comfortable. The law office space should be close to important business and legal centers. A downtown location near courthouses will shorten the commute to hearings and conferences. A historic building with elegant décor could enthrall clients with an eye for architecture or prestige. A good office share space should have a selection of offices in different sizes and shapes and also conference rooms for special meetings. Each law firm has a different makeup and resources. A shared office space should have flexible plans to fit your space and budgetary needs. A shared office space can assist solo or small law practices with increased efficiency, better networking and more referrals. Looking for Office Space for your Law Practice? If you are interested in shared office space in the Coral Gables or downtown Miami area, contact ESQ.SUITES today. 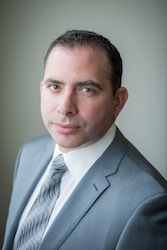 Alejandro E. Jordan, Esq. is the Founder and Chief Executive Officer of ESQ.SUITES, leading provider of shared office space rentals exclusive for law professionals, attorneys and lawyers in South Florida, Miami, Coral Gables and Downtown Miami. Mr. Jordan has over a decade of experience in commercial lease negotiations for all property types, including office, shared office arrangements, multi-family, retail, and industrial properties. His broad base of knowledge allows him to stay ahead of the game and keep abreast of the latest real estate issues and trends.